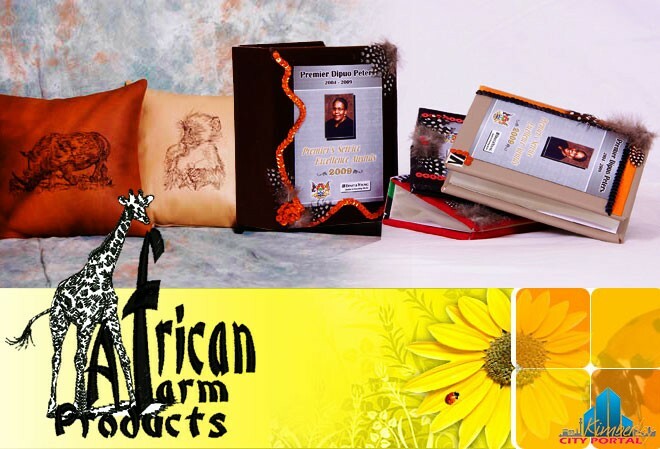 African Farm Products Specialise the creation of top quality, handmade unique South African Products. originated after making clothes from home for my family and later progressed to friends, and their families. We struggled with the farm due to the drought and I decided to take up embroidery to help pay for the bills. I didn’t just want to embroid on the usual T-Shirts, and cloth, and now we specialize in the embroidery of leather and skin. I soon learned there is a high demand for unique South African Products. Hanja, dankie aan jou en Dawid – jy het soos ‘n “instant” vriendin gevoel toe ons ontmoet het. Ek is in ekstase met my uile. Dit was gaaf om julle te kon ontmoet. God’s rykste seen met jul werk, maak my trots op ons boeremense se initiatiewe, deursettingsvermoeë en geloof! Madelein van Vereeniging!